It is a time of civil war. President Porfirio Diaz has resigned and gone to France, of all places. As revolution sweeps the land, the various states and regions issue their own money. 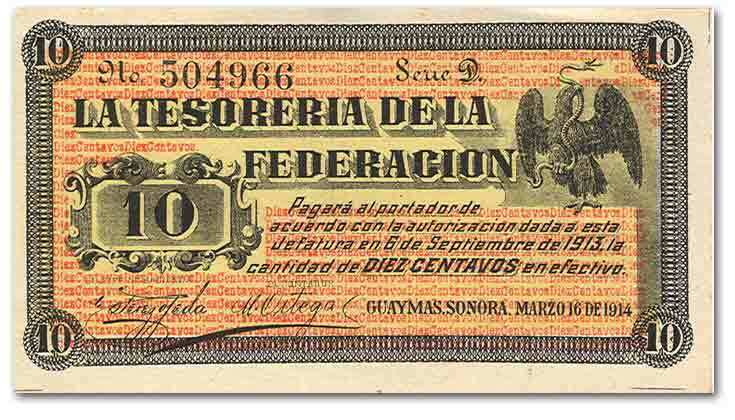 I think thats’ what’s going on here – if so, this bill is national currency from the Treasury of the Federation, but it comes from Guaymas in Sonora, which wasn’t the national capital. And here ends the extent of my knowledge of Mexican history. Click next for more flagrant displays of ignorance!